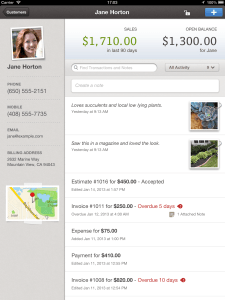 Recently Intuit introduced a new mobile version of its QuickBooks application. In the past when a legacy vendor introduced a mobile application, they tended to do so by stripping out much of the functionality of the full version and prettying up the application with some token functionality that showcased the mobile aspects of the app (look Mom, I can do location!) Intuit have done an interesting job with the new application for iOS and Android and have interestingly thought more holistically about applications for small and mid-sized businesses (SMBs). All this sounds really positive and something of a departure for the traditionally conservative QuickBooks, but here’s where things get murky. When talking about what’s coming next for the application, Intuit suggests that it will likely be integrating its own payments solution, GoPayment into the application. GoPayment kind of works with the application, but only when used as a separate application on the mobile device. Similarly Intuit suggests that data from the wider web (TC suggests Yelp reviews of Twitter updates) and other Intuit partners (ProOnGo or Expensify) will be coming soon. But there’s the rub, the world, and especially the world of SMBs, has grown accustomed to applications having a strong and vibrant ecosystem early on. The foundation building block for this ecosystem is an open and accessible API that enables and encourages developers and other companies to integrate. 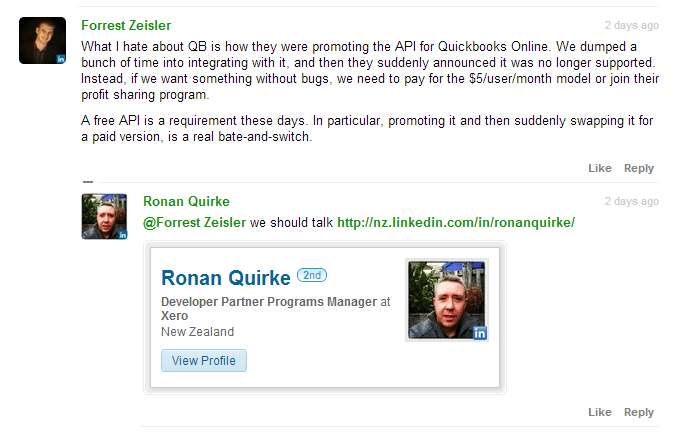 This is the very reason that the Small Business Web, a loose industry group of software vendors selling to SMB customers, insists on an API being a fundamental requirement for joining the group – in their view, and a view that speaks to the realities of customer demands – an API is a base level requirement, without that your application is at best a silo that meets the needs of customers, and at worst simply a silo that doesn’t do anything well. Xero is justifiably proud of its partner ecosystem, it’s got well over 100 different products on the platform, and in doing so has built a compelling way for SMBs to meet ALL their needs (disclosure – I’m co-founder of an accounting migration service, LiveMigrate, that offers migration services to Xero). QuickBooks mobile versions are lovely, and it’s awesome to see them moving into the more customer-centric parts of back office functionality. But at the moment the application is an island, and in this modern world, no one wants to be an island.